Meyer lemons have a sweeter, less acidic flavor than the more common lemons. 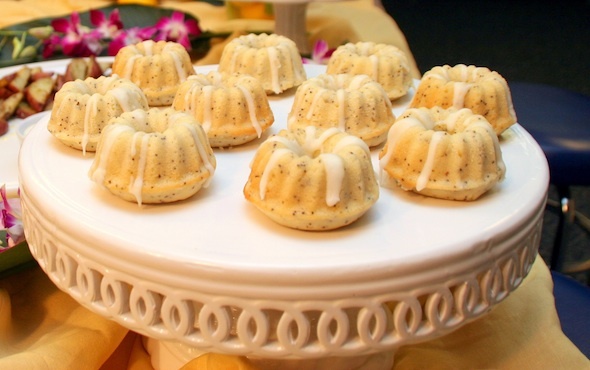 They work great for baking and are a perfect ingredient for these lemony mini bundts! Bake them for a morning or afternoon brunch and enjoy with a cup of tea! Preheat oven to 350 degrees with rack in the center. Lightly spray mini bundt cake pan with non-stick cooking spray. Sift flour, baking powder, baking soda and salt in a medium sized mixing bowl. Set aside. In the bowl of an electric stand mixer fit with the paddle attachment beat the butter until soft. Add the sugar and beat until light and fluffy (about 2-3 minutes). Add the eggs one at a time and beat until well incorporated. Reduce speed to low and gradually add in flour mixture until thoroughly combined, scraping down sides as needed. Add milk, meyer lemon juice, lemon and vanilla extracts and mix until well combined. Stir in poppy seeds. Using a ¼ cup measuring cup, evenly distribute batter inside bundt cake pan holders. Smooth tops and bake until toothpick inserted into the center of the bundt cakes comes out clean, about 12-15 minutes (do not over bake). Remove from oven and allow bundt cakes to cool, about 10 minutes. Transfer to a wire rack to cool completely. To make glaze, whisk confectioners’ sugar, melted butter and meyer lemon juice in a small mixing bowl. If glaze is too thick add additional lemon juice. Immediately drizzle glaze over cooled bundt cakes. Glaze will slightly harden. *Bundt cakes can be stored in an airtight container for up to 3 days and/or refrigerated.